When it comes to management lessons, Jack Ma has a lot of wise words to share. Ma Yun or popularly known as Jack Ma is a Chinese magnate and the founder and executive chairman of Alibaba Group Holding Limited, a Chinese e-commerce company. Alibaba also provides data-centric cloud computing services, electronic payment services, and a shopping search engine. Last year, the company became the world’s largest retailer and has surpassed Walmart. Because of Alibaba’s staggering success, Jack Ma is considered as one of the most influential business man and philanthropist. With a net worth of $38.3 billion, he currently holds the title as the richest person in Asia. Ma’s extraordinary leadership skills and interesting success story fascinated the world. Many entrepreneurs look up to him and see him as a great role model. 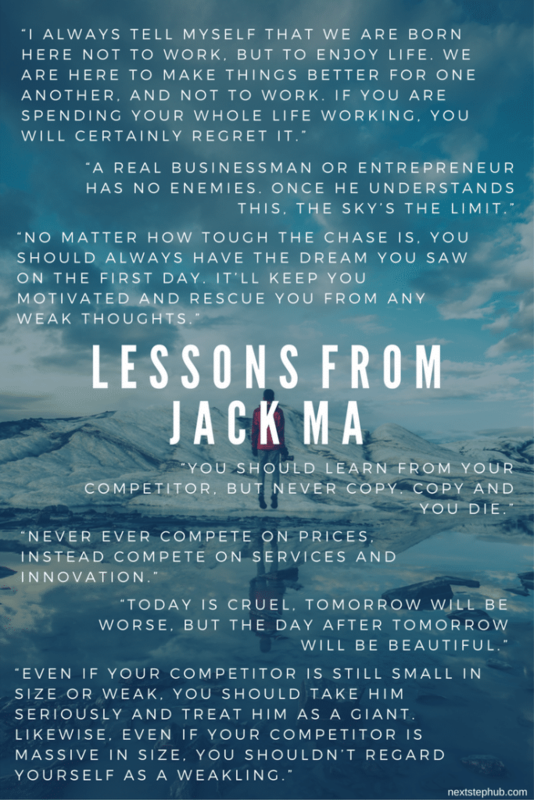 And today, we picked the best quotes and management lessons we can learn from Jack Ma. Jack Ma is not tech-savvy. In an interview with Charlie Rose, he admitted that he can only use his computer for emails and browsing. So how did he manage to build one of the largest technology company in the world? He wasn’t afraid of hiring people who are smarter than him. Many entrepreneurs let their egos keep them from their reaching their full potential. Being an effective manager doesn’t mean you have to be the smartest person in the room. A leader should be willing to listen and learn from his employees. This will not only contribute to the company’s success but to your personal growth, too. Hiring the wrong person can jeopardize your business. Don’t let it happen just because you’re intimidated by someone who’s smarter than you. Jack Ma went through a lot of rejections in his life before becoming the richest person in Asia. He flunked his college entrance exams twice before he got accepted in Hangzhou Teachers University. He got turned down by Harvard 10 times. And believe it or not, he applied for 30 different jobs and got rejected. But all these failures didn’t deflate Ma’s spirit. Like his favorite movie hero, Forrest Gump, he kept running. There’s no straight line to success. You’re going to hit hundreds of bumps in the road. But obstacles and mistakes are part of our lives. As a leader, you must see the challenges as opportunities. Opportunities to prove yourself, to be creative, and to learn. You should also showcase a great level of persistence. Failure is inevitable. But it’s never the end until you decide to quit. Ma believes that it’s easier to unite the company under a common goal rather than uniting the company around a particular person. He knew that it’s impossible to convince every employee or investor to trust his decisions. So instead of uniting them under his supervision, he brought them all together under one goal. Common goals are important because they encourage unity. If your team is working for one goal, the company will have a clearer direction. For Jack Ma, customers come first, employees second, and investors third. According to him, employees can create value and their enthusiasm will result to happy investors and customers. He built a unique work culture at Alibaba which became the foundation of its success. Ma was known for being highly visible in the workplace, singing karaoke with employees, and holding company retreats. His employees treat him like a combination of a father figure, inspirational guru and band leader. As a manager, your team’s happiness should be on your priority list. Try to put yourself in their shoes. Will you be motivated to go to work if your workplace is full of negativity? When your employees are happy, they’ll be more motivated and productive at work. Try to establish a stress-free work place and give them the freedom to be themselves. Build an awesome work culture and acknowledge their achievements–even the small ones. Alibaba had a turbulent start. They had no money, no technology, and no plan. The office opened in his apartment and a lot of companies turned him down for funding. He went to Silicon Valley but he didn’t get venture capital because everyone thought his idea is unprofitable. But did he give up? Ma believed in his vision and continued to develop their own product. They expanded when they finally raised money from Goldman Sachs and Softbank Corporation. As a leader, your strength and endurance will hold the team together. When they see you hustling and fighting, they will be inspired to do the same. Leadership is not for the faint-hearted. You must be ready to face the challenges with your head held up high. Jack Ma is a man of great vision. When he first learned about the internet, he knew that it’s going to be highly popular. His visionary trait pushed him to leave China Pages and follow his own dream–to create an e-commerce company. In 1999, he gathered 18 people in his apartment and spoke to them for two hours about his vision. His dream was to own a global company, create jobs, and change China’s social and economic environment. From the beginning, Ma got huge dreams for his company. And he transformed them into reality. Visionary leaders have their eyes on the horizon and not just on the near hand. They see things in a bigger picture and they think strategically. They are innovators, they work hard to bring their visions into life. Being a far-sighted leader will help the team when struggles arise. While other see dead-ends, you’ll see possibilities. 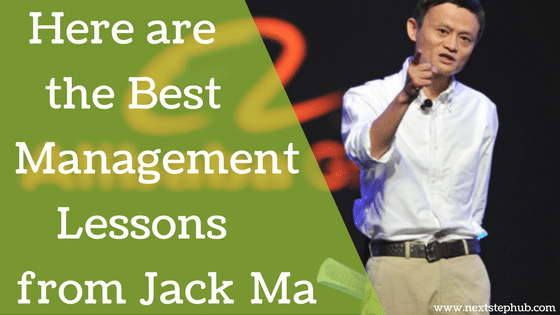 What are your favorite management lessons from Jack Ma? Share it with us in the comments.